The Pittsburgh Penguins have acquired forwards Patric Hornqvist and Nick Spaling from the Nashville Predators in exchange for James Neal, it was announced by executive vice president and general manager Jim Rutherford. Hornqvist, 27, is a four-time 20-goal scorer who posted 22 goals, 31 assists and 53 points in 76 contests this past year, with his point total a career-best. He also served as an alternate captain for the Predators. The 5-foot-11, 189-pound Hornqvist has appeared in 363 career regular-season games, scoring 106 goals, 110 assists and 216 points. His best season came in 2009-10 when he scored a career-high 30 goals. Originally drafted by the Predators in the seventh round (230th overall) of the 2005 NHL Draft, the Sollentuna, Sweden product has represented his native country several times internationally at the World Championships and at the 2010 Olympics. Spaling, 25, is coming off a career year this past season, recording 13 goals, 19 assists and 32 points in 71 games. The 6-foot-1, 201-pound forward has played four-plus seasons with Nashville, registering 40 goals, 44 assists and 84 points in 297 career regular-season games, including an average of 10 goals per season the last four years. 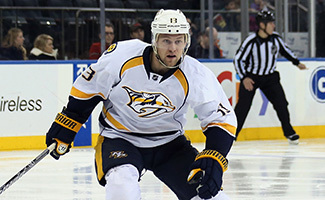 Originally drafted by the Predators in the second round (58th overall) in the 2007 NHL Draft, Spaling played his junior hockey with the Kitchener Rangers of the Ontario Hockey League (OHL), helping that squad win the OHL championship in 2008 and earn a spot in the Memorial Cup. Hornqvist is signed through the 2017-18 season with an average annual value of $4.25 million while Spaling is a restricted free agent.